About half of the nitrogen in our bodies today comes from bacteria via the enzyme nitrogenase, which converts, or "fixes," unreactive nitrogen gas in the atmosphere into a form that plants can use for growth. The other half is produced artificially through an energy-intensive industrial process developed more than 100 years ago. This process, called Haber-Bosch (H-B) after the two chemists who developed it, produces ammonia by using iron-based catalysts to promote the reaction of nitrogen from the air and hydrogen derived primarily from methane. Through another chemical process (Ostwald), the ammonia gets oxidized (reacts with oxygen) to produce nitric acid—a key fertilizer ingredient. While the H-B process revolutionized our ability to grow food, it is largely driven by the use of fossil fuels, consuming about two percent of global energy. It also massively contributes to greenhouse gas emissions, releasing two percent of global carbon dioxide. Finding more environmentally and energy-friendly routes for transforming nitrogen will require the development of new catalysts to speed up the chemical reactions and renewable energy sources to drive these reactions. In October 2016, the U.S. Department of Energy (DOE) Office of Science sponsored a two-day workshop for national lab and university scientists with the relevant expertise to focus on the challenges and opportunities of nitrogen activation. A review article, primarily based on presentations and discussions from this workshop, was published on May 25 in the journal Science. "The article provides a roadmap for fundamental research on nitrogen transformation reactions," said first and co-corresponding author Jingguang Chen, a senior chemist at DOE's Brookhaven National Laboratory and the Thayer Lindsley Professor of Chemical Engineering at Columbia University. "Many of these reactions can occur under relatively mild conditions—without the high temperatures or pressures required in H-B—but the challenge is to identify catalysts that are active, selective, and stable." Chen; co-corresponding author Richard Crooks, the Robert A. Welch Chair in Materials Chemistry at The University of Texas at Austin; and Lance Seefeldt, a professor in the Department of Chemistry and Biochemistry at Utah State University, jointly proposed the topic and co-chaired the workshop. Research on alternative routes for nitrogen transformation without the use of fossil fuels as the energy source begins with an analysis of thermodynamics. In order for nitrogen gas to be reduced or oxidized, the very stable triple bond that tightly holds the two nitrogen atoms together must be broken. "Before trying to find new catalysts with the appropriate properties, we need to determine if the reaction pathways of the alternative routes are energetically feasible," explained co-author and Brookhaven Lab chemist Sergei Lymar. "Many thermodynamically feasible routes do exist, but they have largely been overlooked for the past 100 years because H-B has been so successful. While there is no guarantee that we will be able to run these reactions on a large scale, the thermodynamic calculations provide us with a starting point from which we can screen potential catalytic materials." The Science article describes several alternative processes for oxidative and reductive nitrogen transformations. On the reduction side, one possibility is to replace methane with water as the hydrogen source in the H-B process. A catalyst could split water into hydrogen and oxygen, using energy generated by solar panels or wind turbines. 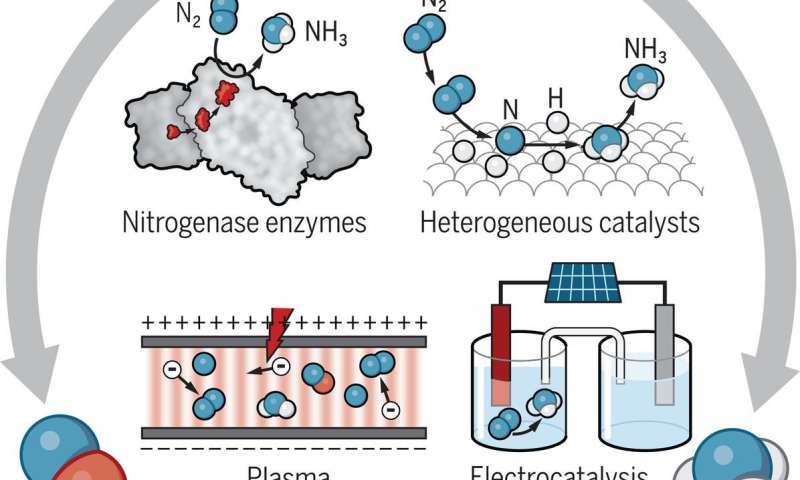 Another idea is to eliminate the H-B process altogether, instead directly producing ammonia in electrochemical cells with electrocatalysts or photocatalysts (light-responsive materials) at the electrodes. The cells could be powered by renewable energy or even nitrogen-fixing bacteria. "Electrochemical transformations are intrinsically clean," said Crooks. "But the limited amount of research that has been directed toward the electrochemistry of nitrogen has really not even established a clear direction for future investigations." Scientists are also trying to understand how nitrogenase works at low temperatures and pressures and without hydrogen gas. If they can mimic the function of this enzyme, they could design new molecular nitrogen-reduction catalysts that operate under less-harsh conditions than those of H-B. Such sustainable approaches would enable ammonia to be produced in a distributed manner rather than through the centralized H-B facilities currently in place. This distributed production is especially important in developing countries that are facing rapid population growth but do not have enough capital to build large chemical plants and the infrastructure to transport fertilizers. If solar panels are installed near farming fields, for example, the energy from sunlight could create the energetic electrons required for reducing nitrogen to ammonia, if appropriate catalysts are available. On the oxidation side, scientists are investigating the direct reaction between nitrogen and oxygen gas to produce nitric acid. Nearly all of the 50 million tons of nitric acid produced annually is manufactured indirectly through the Ostwald process by the oxidation of H-B-generated ammonia. "The current way nitric acid is produced is kind of backwards from an electron flow point of view," said Lymar. "First, nitrogen is reduced all the way to ammonia and then ammonia is oxidized all the way to nitric acid, spanning all of nitrogen's eight oxidation states. It would be more practical to directly oxidize nitrogen with oxygen, but this reaction becomes spontaneous only at extreme temperatures." One idea to overcoming this problem is to oxidize nitrogen in low-temperature, nonthermal plasmas—weakly ionized gases that contain "hot" energetic electrons and near-room-temperature molecules, atoms, and ions. By vibrationally exciting nitrogen molecules, nonthermal plasmas could help catalysts accelerate the oxidation reaction. The article also describes approaches to reduce air-polluting nitrogen oxides. These gases are produced when nitrogen and oxygen react during combustion. The exhaust from vehicles is a major source of nitrogen oxides, which contribute to the formation of smog and acid rain. 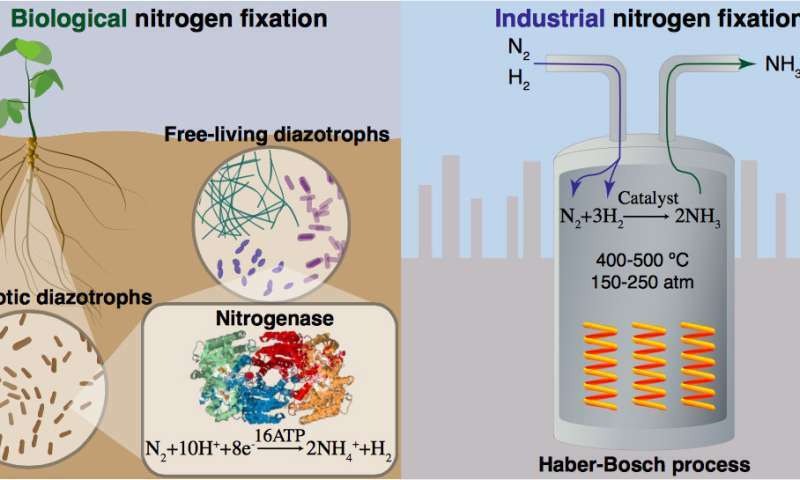 Certain bacteria have enzymes that reduce nitrogen oxides to nitrogen gas, and these denitrifying bacteria will likely be a source of inspiration for scientists seeking to design new catalysts for environmental protection. "Progress in any of these areas will require a molecular-level understanding of natural and artificial nitrogen transformation reactions," said Chen. "The goal of this article is to provide directions for basic research, hopefully leading to the development of simple, low-energy routes for manipulating the redox states of nitrogen."